Established in 1913 by two friends who dreamed of having the rare ability to represent multiple large insurance companies for their clients, Lewis, Hopkins & Williamson was introduced to the local community as one of the first independent insurance brokerages. Based on old-fashioned relationship-building values and personal customer service, Lewis, Hopkins & Williamson began to expand its clientele to neighboring towns and states. This is the story of that dream—a century-old dream focusing on personal relationships with clients—because we know the work we do for them is important. In 1930, A. Foster Williamson earned partnership and the brokerage became known as Lewis, Hopkins & Williamson (LH&W). As LH&W’s clientele increased, so did the demand for young and passionate brokers. In 1962, lifelong West Chester resident and Gettysburg College graduate James A. Whitcraft accepted his first—and what would be his only—job at Lewis, Hopkins & Williamson. Shortly after, Jim was drafted into the U.S. Army and served in the 98th Army Band from 1963 to 1965. After more than 53 years of dedicated loyalty to his clients, Jim retired in 2017, but still privately consults with select clients and mentors LH&W advisors and brokers. What makes LH&W a family agency? 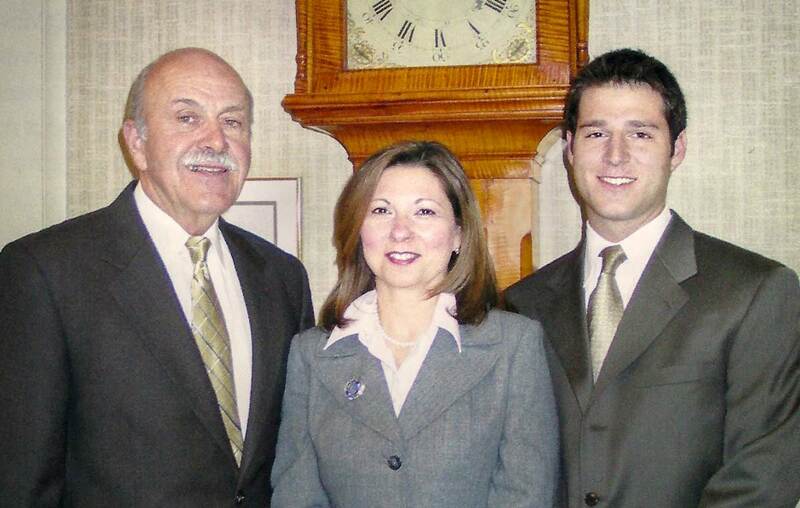 To be completely honest, I’m not sure I’d even exist without Lewis, Hopkins & Williamson: My father, Jim Whitcraft, was the president of the brokerage for over 45 years. Forty years ago, he hired an ambitious woman to process claims, who—after only three months of courtship, I recently learned—he would eventually marry, and who became my mother. Madeline is still the controller and accountant at LH&W. My younger sister, Katie, worked with us for over five years building personal connections and providing customer service for clients, which would provide her with valuable experience she uses today in her current career on the insurance company side. I grew up in an insurance family, so insurance is something that has been in my blood my entire life. I went to middle school and high school with my textbooks wrapped in insurance company gift paper, while the other students in my class used grocery store brown paper bags. That said, I didn’t ‘fall’ into this career; I chose it. Today, my family, and the entire staff at LH&W, only knows one way to do business, and that is to respect, listen to, and advise our clients as an extension of our family. There’s not a lot of sitting around at LH&W. Our personal and commercial insurance clients have a few weeks (and sometimes only a few days) to complete the transaction of an asset or new business contract, which means we’ve got to keep their pace. We are ready and committed to work hard and take ownership to produce the best results each and every time for them. It’s about setting expectations and being more proactive than the competition. Our clients are kept in the loop through the entire process. We are collaborative. When we are constantly coming up with new solutions for our clients, we’re helping them be more successful. Our product is our people. The one common thread we share as members of LH&W is that we love what we do, and to be great at what you do, you’ve got to. A mixture of the right people and over 100 years of institutional problem-solving strategies allows us to continually transform in our creative and relentless pursuit of our clients’ success.